In the current economic climate many of us don’t have lots of disposable income to spend on the home, but sometimes we do need to decorate or replace furniture, so how do we go about doing this without spending a fortune. 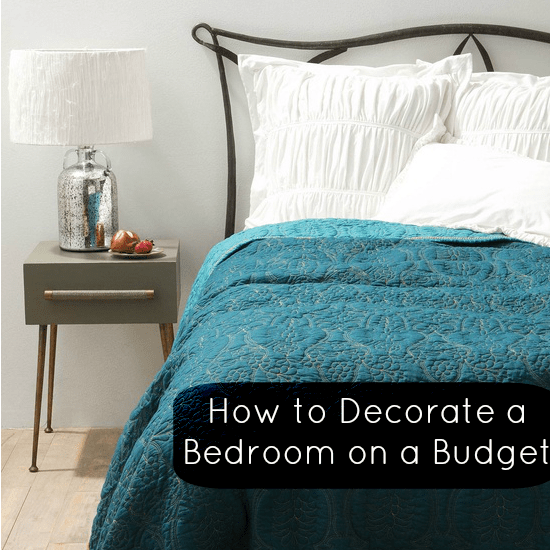 I’ve been giving this some thought, and so have put together my tops tips for creating a lovely bedroom on a budget. I’m not going to say much about it because I talk about it every time I write a piece like this, but don’t forget to have a really big declutter before you start any project like this. If there are things you don’t want or need anymore, see what’s in good enough condition to sell on Ebay and raise some funds for your new bedroom this way. The blog Oyster and Pearl has some lovely posts in her Project Simplify section giving great tips on decluttering. And don’t forget to give it all a really good spring clean, which won’t cost anything but your time. Be creative and imaginative with your decorating and accessories. You don’t have to spend a fortune to change the room. Even changing the furniture will give the room a new lease of life and make it feel fresh and new. Add throws, cushions, a new duvet set or a few fragranced candles to jazz up what you already have. Make new wall art from inexpensive frames and gift wrap, or even pretty shop carrier bags. Look around and see what you can recycle or upcycle. Would you be able to save those bedside tables for example and give them a new lease of life. It will be much cheaper than buying a new set. Look at blogs like Mum of All Trades, who runs fabulous upcycling tutorials or hunt Pinterest boards for inspiration. A room of individual, unique pieces of furniture and accessories will be much more interesting than something that resembles a home store catalogue. All it needs is a little imagination and a few items from the local DIY store. When you’re on a budget it’s well worth looking around charity shops, Ebay and websites like Freecycle to see what second hand bargains there are to be had. Maybe you’re looking for something good value that you can upcycle as we’ve mentioned already, or maybe you want something older and more vintage looking. This is the place to find it. Shop around and find great website that offer value for money furniture. Somewhere like Lazy Beds where you can find a really inexpensive bed if you need one. Look out for the sales and shop online where you can; it’s usually cheaper. And don’t forget Supermarkets and DIY stores who have good inexpensive ranges of furniture. If you haven’t learn how to do DIY or how to paint or hang wallpaper, now’s the time. The money you will save by doing all of this yourself will be plenty. Labour is one of the most expensive things you can spend your money on when decorating. Admittedly you need to have the time, but if you’re on a budget you need to find the time. There are lots of courses you can go, online tutorials that you can learn from, magazines that teach you or even ask a knowledgeable friend to show you how. If you keep furnishings neutral you can add a few key items to make a difference. This way you can update that look as you wish, much more frequently than if you use bold or patterned designs in the first place. Look at what you have and love and can continue to live with…seek only to change or add if it will enhance what’s there already. If you are on a budget you don’t need to be replacing everything. Photos make a wonderful addition to a room and can really alter a mood and these are very inexpensive but make the room individual and unique. What do you think? Do you have any decorating on a budget tips yourself? If so, I’d love to hear them! I am in the process of doing our boys room on a budget. We had an old set of bookcases and CD towers which we have now replaced from downstairs, one of the bookcases will now be going into their room, and the CD rack with no shelves it will be turned at a 90 degree angle as it is the perfect length and width to make a double shelf at the side of their bed, I then asked on freecycle if anyone had the same CD rack they no longer needed and have been given 2 so both beds will get one and I can use the other as a display thing in our downstairs toilet once we get round to doing that out as it is the perfect width for the space between the toilet and the wall. I also got given blue paint from freecycle and have asked for dark colours as I am going to jazz the room up myself with a murial on their wall. Great tips and thank you for the mention! We (my husband and I) found a 60 year old dresser/chest set in my parent’s storage last month and decided to clean them up and paint them! It’s been amazing to see the transformation, plus we saved a TON of money. Then there is the added benefit of being able to use furniture that belonged to my Grandparent’s.